(1) THAT’S WHO. Paul Cornell has a few paragraphs about Gallifrey One, the Doctor Who convention he attended in LA last weekend. An edition of The Cornell Collective recorded there will be going live in a few days, but in the meantime, you can find me guesting on another podcast from the convention, Doctor Who: The Writers’ Room, where myself, Graeme Burk, Stephen Schapansky and regular host Kyle talk about the career of Robert Holmes. I also appear in this edition of Doctor Who: The Fan Show, recorded on the convention floor, and providing a wonderful snapshot of everything that makes ‘gally’ special. Conrunner Shaun Lyon, Fifth Doctor Peter Davison, Paul Cornell, Laura Sirikul (Nerd Reactor), Sarah Dollard, and Steven Schapansky (Radio Free Skaro), all appear. (2) GWEN COOPER R.I.P. ScienceFiction.com says it’s over: “’Torchwood’: Eve Myles Lays Gwen Cooper To Rest”. The actress took to Twitter to respond to fan inquiries regarding the nebulous status of ‘Torchwood’ which aired its last episode in 2011, after the show was picked up by Starz and relocated to the U.S. Fans have held out hope that the show would revert back exclusively to the BBC, but Captain Jack, Gwen and whoever was still alive haven’t materialized on ‘Doctor Who’ or anywhere else. It’s been five years and at least Myles has given up hope and said goodbye to Gwen. @HThorrington_ yea. well Iv made my mind up and GC is now Laid to rest..thanks guys for living/hating her… Nightnight. (3) YOUR WRITE. Joseph Bentz has an outstanding post about writing – “Don’t Let Them Squash Your Creativity”. Growing up, I always felt vaguely embarrassed about wanting to be a writer. I feared that if I said too much about it, I was simply opening myself up to mockery. It felt so pretentious to want to write a novel. Who was I? So I hid it. I wrote my first novel almost secretly. When I would go off to write, I would be vague with family and friends about what I was doing, telling them simply that I had work to do. In college, I was so paranoid about my roommates reading over my shoulder that I developed a secret coded language in which I could write when others were around, which I then had to decode later. Today I am still tempted to let my creativity be squashed, not so much by naysayers, but by other enemies such as procrastination, the pressures of life, fear of rejection, weariness. Yet the words, the ideas, keep bubbling up. When the ideas come, I think, I have to write this. Why is no one else saying this? I find myself writing as fast as I can, letting the momentum carry me. In those great moments, the creativity blasts right through the doubts, tiredness, discouragement, and second-guessing. I write. I create. Tbornottb used a gutted broken clock that he purchased from an antique store as the base and had a friend illustrate the new face of the clock, which featured locations such as on the way, home, work, holiday, forest and mortal peril. He then used a Particle Photon that would communicate with an application known as “If This Then That” that would move the clock’s hand depending on each family members GPS location. Each family member then set the parameters for what each geographical location would be represented by on the clock. “Most of the rules are location-based (setting me to WORK if I enter my university library, HOME if I enter my dorm), but you can set other triggers too (set me to HOLIDAY if the forecast calls for snow, set me to MORTAL PERIL if the stock of the company I’ll be working for next year drops too low),” tbornottb wrote. Steve Spielberg headed into The VOID’s unique brand of free-roaming, mixed-reality VR experience at TED 2016, and it seems he was pleasantly surprised. “Woah, that was a great adventure!”, was Steven Spielberg’s exclamation after stepping out of the bespoke, made-for-TED mixed-reality, VR experience constructed by the team behind the VOID. Spielberg, who recently co-founded the immersive production startup The Virtual Reality Company, stepped through the specially constructed, Raiders of the Lost Ark-style VR experience, which has players exploring ancient ruins, avoiding traps and snakes and, we understand, some clever heart-quickening physical stage manipulation to coincide with some worrying virtual events. In an interview, Mr. Stephenson — whose title is chief futurist — declined to say what he was working on at Magic Leap, describing it as one of several “content projects” underway at the company. More broadly, Mr. Stephenson said science fiction books and movies are often useful within tech companies for rallying employees around a shared vision. “My theory is that science fiction can actually have some value in that it gets everyone on the same page without the kind of expensive and tedious process of PowerPoint,” he said. But the influence of the genre within tech companies is “surprising and mysterious to me as well,” he added. And I’ve dropped all my editing projects but Wild Cards. (9) CREATIVITY DOESN’T WORK LIKE THAT. Jim C. Hines has a good post “My Mental Illness is Not Your Inspirational Post-it Note” that doesn’t lend itself to out-of-context excerpts… so just go read it anyway. (10) LAUNCHING MADE SIMPLE. How To Go To Space (with XKCD!) was posted last November but I don’t recall linking to it, and in any event, these things are always news to somebody! (11) MARK JUSTICE OBIT. Horror author and radio host Mark Justice (1959-2016) passed away February 10 from a heart attack. Brian Keene discussed his writing in a memorial post. Mark’s books included Looking at the World with Broken Glass in My Eye and (with David Wilbanks) the Dead Earth series. He also ran one of the first — and best — horror fiction-centric podcasts, Pod of Horror [with Nancy Kalanta]. He was generous and genuine, and very, very funny. He knew this genre’s history like few others. He will be missed. To help Mary with the financial burden, I wanted to announce that ReAnimus Press will be donating our publisher’s share of sales from all sales of Bud’s book back to Mary, so sales of those titles will be entirely to help Mary. We’ve published the ebook editions of Bud’s ANTHOPOLOGY 101 (http://reanimus.com/store/?i=1256 ) and THE JOY OF BOOKING ( www.reanimus.com/1409 ). We have PAST MASTERS in process. February 17, 1922 — Terrified audiences gaze upon FW Murnau’s Nosferatu for the very first time. (15) THEY SWEAR THESE ARE GOOD IDEAS. In Comic Riffs at the Washington Post, Michael Cavna and David Betancourt attribute Deadpool’s huge success to its attracting both superhero fans and people who enjoy R-rated snark such as is found in Judd Apatow films. Then they say — “These are the ‘R-rated’ comics that Hollywood should put on the screen next”. MICHAEL CAVNA: So you and I knew that “Deadpool” would do reasonably well, but these monster box-office numbers that practically rival “The Dark Knight’s” debut certainly speak to a thirst for R-rated comics adaptations that don’t feel like the same old tales of origin reboots and capes-vs.-urban apocalypses. So if you were a Hollywood executive, what’s the first “mature content” comic you’d now try to option and adapt? DAVID BETANCOURT: The top two that come to my mind are American Vampire and Y: The Last Man. Last Man [which was adapted in 2011 in short form] has been in movie limbo for a while now, and I’m surprised someone hasn’t scooped up American Vampire. Fox has somewhat of a fun dilemma on their hands. “Deadpool” literally made twice what most folks were thinking it would for its opening weekend. So if you can spawn X-Force out of “Deadpool,” given Deadpool’s connection with Cable, do you continue the “R” momentum and make an X-Force movie rated R as well? If X-Force was in development [prior to “Deadpool’s” release], Fox must have been thinking PG-13 — just like the X-Men films. But now, seeing the success of “Deadpool,: maybe Fox executives have more than one R-rated franchise. They have to at least be thinking about it. And because of “Deadpool’s” success, if that character [now] appears in an X-film, does he [himself[ seem diluted if he’s in a PG-13 movie? (16) HE WAS THERE. Matthew Surridge looks back on “The Great Hugo Wars of 2015”, and devotes many paragraphs to how he decided to decline his Hugo nomination. Then the next night I opened my email to find a message from the Worldcon administrators congratulating me for being nominated for a Hugo. If I wouldn’t be at Worldcon, could I please select someone who’d be able to pick up the award for me if I won? I emailed Black Gate editor John O’Neill, and asked him if he’d be in Spokane. He said he wouldn’t, and also mentioned that Black Gate had been nominated for a Fanzine Hugo. That meant I’d now heard of three Puppy picks who’d gotten nominations. I poked around some message boards and found speculation from various people plugged into the field guessing that the Puppies would do spectacularly well when the full list of nominees was made public. One (non-Puppy) editor said that he’d heard that the Puppies had three of the nominations for Best Novel—the most prestigious category. I began to wonder if I wanted to be nominated for an award that was being shaped by the Puppy tactics. If nothing else, what kind of backlash would this create? Over the next few days I did more research on the Puppy program. Beyond politics, it was clear I didn’t share the Sad Puppy sense of what was good and bad in fiction. Beale only spoke about “the science fiction right,” but Torgersen was putting forward an aesthetic argument about the value of adventure writing over “message fiction.” I like good pulp fiction, but prefer experimental writing. More: it became clear to me that Torgersen and Beale knew that what they were doing was a slap in the face of the SF community—the people who attended events like Worldcon and administered the Hugos. As far as they were concerned, many of the existing institutions of science fiction fandom were not only dominated by liberals, but corrupt, and therefore had to be either reformed or burned down. The Puppies were looking for a fight. Black Gate put up a link to the post as well, which led to an exchange of comments between Surridge and his former admirer, Wild Ape. (17) GRAPHIC ARTS. Camestros Felapton in “SP4 Book Families” proves Hugo voters and Sad Puppies 4 recommenders are equally innocent. Or equally guilty. Never mind, look at the pretty graph. Another stray observation from SP4 Best Novel data partly inspired by an odd claim at Mad Genius that ‘weak correlations’ in Hugo2015 nomination data was evidence of secret-slate/cabals/whatever (um, nope it is what you’d expect). I looked at which books had nominators in common and how many nominators in common they had. I then tabulated those books with more than 2 in common and drew a pretty picture. (18) NEBULA PREDICTION. Chaos Horizon looked at the SFWA Recommended Reading List data from 2011-2014. 3/4 times, the top vote getter from the Recommended List went on to win the Nebula. Schoen must be dancing right now for Barsk, which topped the 2015 list with 35 votes (Gannon did get 33, and Wilde 29, so Schoen shouldn’t start celebrating yet). The only exception to this rule was Kim Stanley Robinson in 2012. Maybe KSR, who had 11 prior Nebula nominations and 2 prior wins, was just so much better known to the voting audience than his fellow nominees, although that’s just speculation. That KSR win from the #4 spot does stand out as a real outlier to the other years. The Top 6 recommended works got nominated 19/24 times, for a staggering 79.1% nomination rate. If you’re predicting the Nebulas, are you going to find any better correlation than this? Just pick the top 6, and bask in your 80% success rate. (19) LEGO. This year Lego will release 25 Star Wars-themed sets. 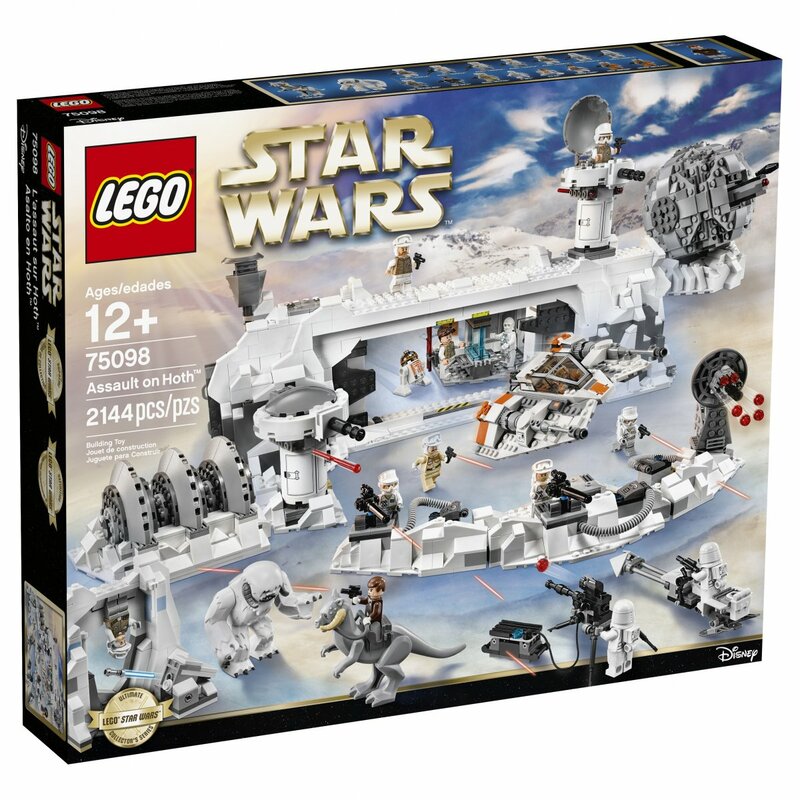 The “Assault on Hoth” set, coming May 1, has 2,144 pieces and costs $250. The latest version of Monopoly adds a new spin to the debate over who gets to be the banker. The decades-old board game, a Hasbro Inc. brand, is getting a modern upgrade this fall with an “Ultimate Banking” version that does away with the game’s iconic paper money in favor of bank cards. In place of a pixel, you would have a scroll! Not dark, but beautiful and terrible as the dawn! All shall love me, and despair! (22) KYLO REN’S TEEN ANGST. Mamalaz has a whole series of ridiculous “Modern Solo Adventures”. This entry was posted in Pixel Scroll and tagged Black Gate, Bud Webster, Camestros Felapton, Chaos Horizon, Comic Riffs, Crystal Huff, David Betancourt, David Doering, George R. R. Martin, Harry Potter, Jim C. Hines, Joseph Bentz, Lego, Matthew David Surridge, Michael Cavna, Paul Cornell, Spielberg, Star Wars, Torchwood, Worldcon 75 by Mike Glyer. Bookmark the permalink. If we were to separate people into countries we’d have to recognize not all Asians are the same. Plus country borders change and I might have to learn your parents/grandparents now live in y instead of x and that doesn’t match the little bit of world geography I learned in school. #NotAllAmericans. We have baked in this kind of institutional racism (for lack of a better word) into our culture. It’s slowly changing because of the evil SJW conspiracy which is against free speech by allowing people and groups to call themselves what they want and honoring that. But would you also describe Sunil Patel as an Asian Author? Heh. As always, worth noting that “Asian” as typically used in the US, and “Asian” as typically used in the UK, tend to encompass different ethnic origins. Chinese/ Japanese/ Korean in the former, people from the Indian subcontinent in the latter. Arabs and Polynesians seem to be treated distinctly, or at least not part of the Asian shorthand, in both places as far as I can tell. NickPheas @Tasha: But would you also describe Sunil Patel as an Asian Author? “Asian” as a collective term for people whose ethnic origins are in, roughly, Southeast Asia is the product of an effort starting in the 1950s, led I believe by a Korean-American, to fight discrimination on college campuses. There weren’t enough Korean, Japanese, or Chinese students to mount meaningful separate movements, but this guy had the insight that if he could persuade them to adopt an overarching ethnic identity, there were enough of them combined that they could have a real effect. And he succeeded. The UK doesn’t share that particular bit of history, and also has much stronger historical and cultural ties to the Indian subcontinent. I just wish everyone would speak the same English language. The correct one. The one I speak. Or you know I could define my terms remembering there is an entire world out there and my way is only one way. But what would I have to be outraged about? Conversation might get downright civil. Who would want to live in that world? Oh right that would be me. Sorry for not defining what Americans call Asian/Asia. If you grab a US map we have it clearly mapped out. It says Asia. It’s those oriental countries (1970s it’s how I was taught). Doesn’t the entire world label their maps this way? Did I mention baked in institutional racism? Yeah we are really good at it. Asia would be Japan then China & the other coastal countries to what used to be the USSR in basic generalization. My teachers were right memorizing the it’s going to be out-of-date map would come in handy one day. Africa, India, and the Middle East are separate for reasons. Then you’ve got what was the USSR and Europe. Takes care of that continental area. I’m giving you my 1970s education version of world geography in exaggeration. And that’s exactly why I don’t trust ‘Asian’ as an ethnic group. I hadn’t realized how much world geography was easier if I looked at it from a racist point of view before. This stuff is all explanations I’ve seen/heard that have embedded themselves in my head. Get out, get out. GET OUT. Honestly I did think everyone in the world pretty much agreed on which areas were called what. Well when I give it serious considered thought I know better but off-the-cuff default… My bubble has been shattered. ETA: I really hope people are getting the humor in my comments and not being offended. Please, please, please tell me if I’ve offended anyone. @James My Asia includes Asia Minor. Do the people in the Original Asia agree to this terminology? Here we get to my big problem with the entire discussion we’ve been having. It’s been about how the rest of the world defines areas without regard to what those countries and their people think of themselves. A bit too much colonialism and white people define others for my taste. Which is why I was so over the top in my definitions. Really, seriously, it’s a well-defined boundary at the Bosphorus, with lots of continuous use stretching back 2500 years. My Turkish friends would give me a bit of a side-eye if I told them that ‘Asya’ was problematic. So far as my own limited anecdotal experience goes, while there are more individuals within those communities who identifies themselves “Asian” rather than as East Asian/ South Asian/ Southeast Asian, it’s far more prevalent to break down to a more granular identity – Tamil, Hakka, Filipino, Hmong, Indonesian etc. etc..
@rob_matic – Again from personal experience, you’d get a lot more than a side-eye if one was to, say, mis-identify, or to think an Iranian or Turk is part of the Arabic community. It’s a mistake I’ve learnt one learns to never repeat. @snowcrash you’d get a lot more than a side-eye if one was to, say, mis-identify, or to think an Iranian or Turk is part of the Arabic community. It’s a mistake one learns to never repeat. My husband made that comment when I shared a little bit about this discussion. Er, it may be a cultural thing, but all the Arabs I’ve known either referred to themselves as Arabs or as Jordanians, Palestinians, etc., with Arabic used only when identifying their language. Or, if they are, as Muslims. Huh, people wanting to be known by the countries they live in instead of lumped together because reasons. Imagine that.